Commercial bathroom remodeling Austin is supremely different than any fine bathroom upgrade involving a residential setting. You have to consider the needs of the general public and not simply the needs of a certain set of employees involved at working at a business. There are many guidelines and sets of rules to be considered. Compliance with these regulations will be acheived by first hiring an experienced commercial building contractor. Be aware that a true residential contractor normally does not possess the knowledge of the contractor operating within the commercial world of construction. He simply does not use nor is he confident with all the commercial rules. Meeting and understanding the ADA accessibility regulations as they pertain to all commercial buildings requires a certain skillset and experience. A commercial contractor will possess the knowledge of the building's structure and composition along with the experienced ways of altering the construction to bring it into compliance. 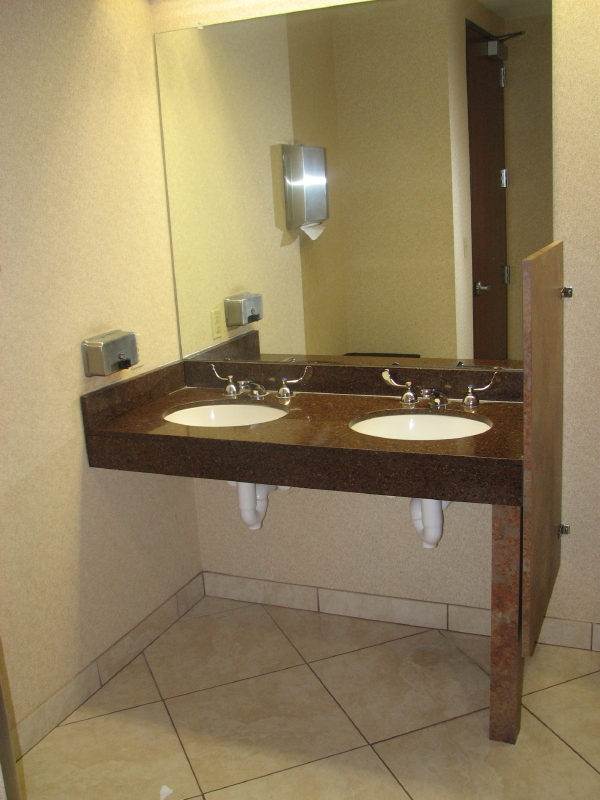 A completely serviceable special needs bathroom must contain an ADA accessible vanity. The vanity must be one with a clear underneath scald protected area having an unobstructed roll under capability for wheelchairs. A five foot turning radius allowing the wheelchair to maneuver an approach must also be associated with the ADA vanity. The area of travel will then be enhanced by an unobstructed clear accessible barrier free route dedicated to reaching the vanity. Whether the job concerns ADA remodeling or new construction, commercial or residential, the end result will always be the same in aiding those who no longer or have never had the choice of a means of locomotion. Sometimes folks need a little help beyond the rest of us to be self sufficient and hold on to their dignity. That's when the clear accessible route comes into play. This designated route wil make it possible for those with special needs to enter through the front door and travel into any room of the structure without barriers like the bathroom. There are basically two styles of ADA vanities that comply with an unobstructed roll under area below the sink. This capability has everything to do with both the water supply lines and the main waste line connecting the sink. There must be provisions made to protect the user from being scalded when coming into contact with any one of the plumbing pipes serving the sink. These connecting pipes may become heated merely by the water passing through them creating the problem. The open type model should always receive both waste and supply insulating jackets applied directly to the pipes providing protection for the wheelchair user. The closed model concealing the pipes will be equipted with a removable face or face board covering the pipes. This pipe concealing panel must be installed at the correct angle. This allows for the needed unobstructed legroom required for the user. The vanity can extend beyond the sink but the area containing the sink is required to have this roll under capability. This section of the vanity must not be any taller than 34 inches above the finished floor with sufficient lower clearance. Clear unobstructed reach distances around the countertop area must be observed. Any motion controlled sensors integrated into the various dispensing devices and/or plumbing fixtures throughout the restroom present a true hands free benefit to all the restroom users. If these aren't in the budget then at least wrist handles used for controlling the faucet can be incorporated into the design of the vanity. Furthermore, automatic flush valves should be used on all toilets and urinals that provide for hands free use. Regardless of whether there are special needs people working within a commercial building or not, we are required by law to make all the common areas ADA accessible. Homes provide a different situation because the alterations are put in place for specific full time occupants. The barrier free accessible route put in place must be observed as a means of life safety and function. You just never know when a personal life changing situation can appear requiring help for those with special needs. If one does occur we do have the means to offer aid and safety to those who have become afflicted in some unfortunate way and to help preserve their personal dignity and independence. Using larger commercial cabinetry designs can compensate for the lack of separate office space if the occupants sharing the new facility participate in only one group or a single activity. The larger pieces can be located within a crowded common room or set aside to stand alone. They have the capability of bringing a like group together only to accomplish a given task. 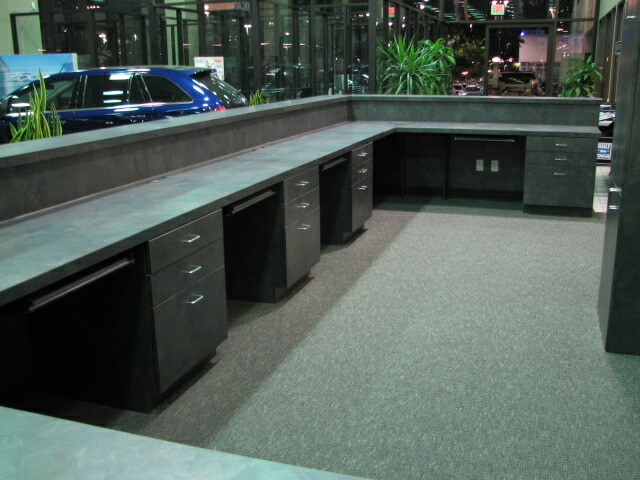 Austin commercial cabinets incorporating multiple work stations can be used as a greeting place to begin business with your customers or as a place to conclude business. Multiple work stations are great in teaching facilities requiring access to an individual computer setup. They can be seen in bank teller desks, sales towers (see attached photo), or the main desk in a fine hotel or airport. Use them to accomplish different activities within a given space as in a guard or security area (see attached photo) of a facility. Each is totally efficient when used for a single duty. Whether you are dealing in commercial bathroom remodeling, breakroom upgrades, or are in the need of an interesting reception desk you will need the help of a reputable commercial contractor. Every design that will be located within the common area must follow ADA rules for accessibility. 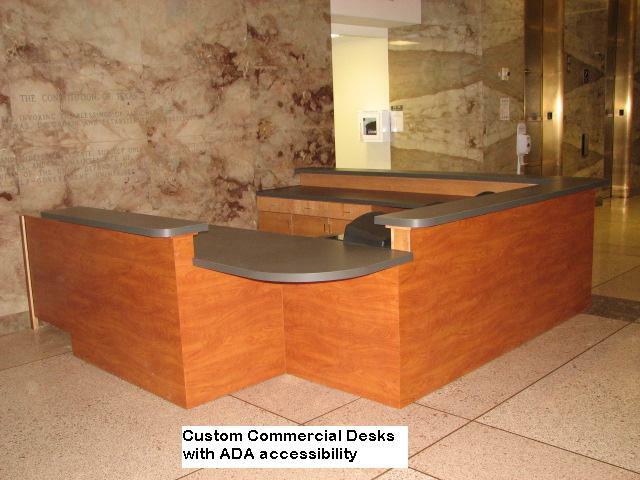 Service desks should have designated areas with lowered heights and roll under capabilities to serve the people with special needs. Any commercial cabinetry not located within the common area can take on standard heights and depths. Commercial fine cabinetry can support undermounted monitors providing for the full desk top area, pull out keyboard trays which also conserve space, or CPU mounts that conceal and keep the machines out of the way or taking up space within a given cabinet. These customized cabinets can give your business a sleek, efficient, and organized appearance and assist in keeping clutter out of the public eye. Many configurations are possible to house the work stations in any required number. Just remember that careful thought for function is required prior to settling on a design and don't forget to make your facility ADA accessible if the general public will be served. Commercial cabinetry, because of the increased use, must pass the durability test. Many people use and are constantly around pieces like reception desks and the traffic must flow well. All surfaces must be durable and be able to take a pounding. Proper drawer guides must be adequately matched with drawer content weight. Shelf brackets should also fit the weight of the materials they are holding up. Counter tops must be tough but look sharp. Reach limits must be realized and comfortable so that the user never has to leave his or her chair. All commercial bathroom accessibility modifications in Austin, Texas should always provide for total accessibility. Never take for granted your great fortune of having free and total mobility because your situation could change in an instant. In effect plan for your unthinkable changing future no one could have fathomed. This consideration should always take precedent when compiling your list of specifications not only to satisfy the legal ADA parameters but as a means of providing equal comfort for all patrons. There are numerous published federal, state, and local guidelines but your local municipality is the dominant entity to satisfy. Federal regulations are a good starting point but these have been revised from state to state. However all enforcement begins with the accessible route and ends at the bathroom in question. 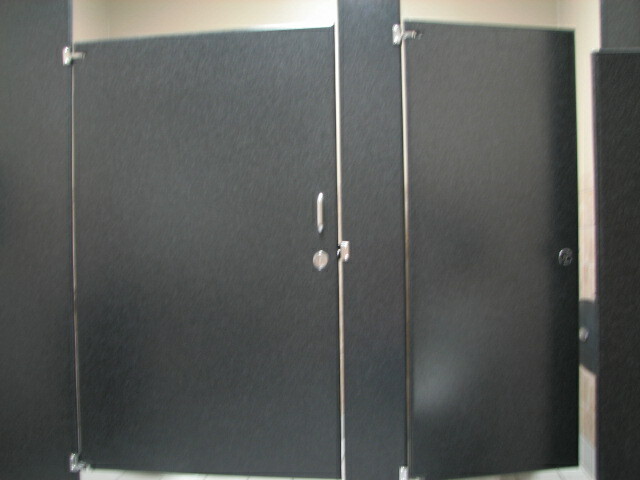 Commercial construction professionals considering any fine bathroom upgrades should begin with the entry door. Is the width substantial for a wheelchair to enter and if so does the closer make the door too hard to open for the impaired? Once inside is there adequate floor space for a 5' turning radius? A typical one toilet and one ADA compatible sink basic restroom measures 7 feet by 7 feet. New commercial cabinetry at the vanity should be built to provide the proper top height and have roll under capability protecting against scalds from the plumbing pipes. Other pertinent questions to consider include; is the urinal in a men's or unisex facility the correct height and is there room for access meeting all ADA guidelines? Does the partition layout provide for at least one handicap stall with adequate room and entry and does it contain a comfort height toilet? Do you have the correct grab bar configuration for the stall in question? Once these criteria are met you must now consider any dispensers for paper towels, soap, and toilet paper or any other fixed amenities. Are they located at the proper height and is there a reach factor not taken into account? Do you have blade handles to control the faucet at the vanity? Compliant ADA accessible bathroom upgrades or remodels are no longer considered to be over the top or a needless expense. You never know when you yourself might need help with your own bathroom needs following a temporary or permanent life changing situation.